Calculating the Distance Between Meridians of Longitude Along a Parallel of Latitude. At the Equator, the distance between meridians of longitude is 60 n.m. (or 60.113 to be precise). However, as we move north or south away from the equator, we find that the distance between them decreases as they converge towards the poles. So how do we calculate the distance between meridians of longitude along a particular parallel of latitude? Consider the diagram below. Let CD be an arc of no of longitude measured along the circumference of the great circle which is the Equator. Let AB be an arc of no of longitude measured along a parallel of latitude. Let Q be the centre of the plane of the small circle which is the parallel of latitude. Let O be the centre of the plane of the Equator. 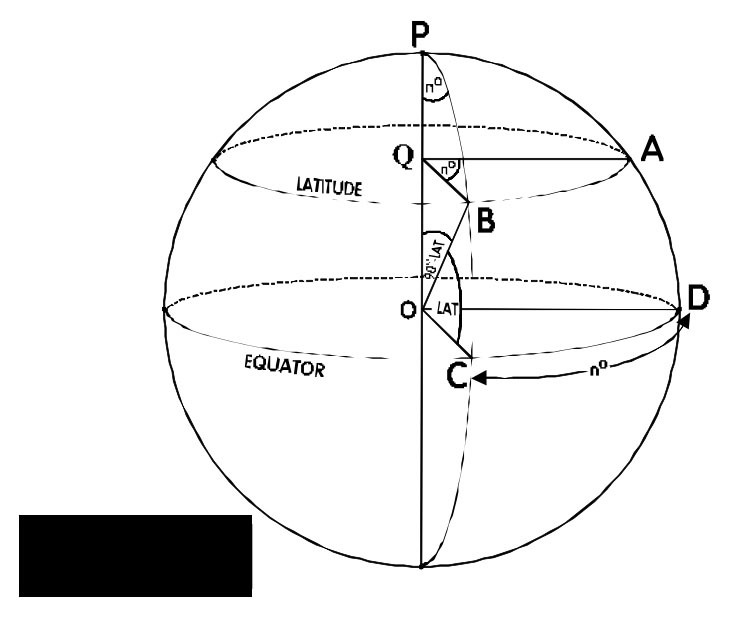 Using the formula C = 2πr, we can deduce that the circumference of the Equator equals 2π.CO (since CO represents the radius of the Earth in the diagram). Therefore angle QOB = 90o – Lat. and angle QBO = Lat. (alternate angles). angle OQB = 90o (since the plane of QAB is at right-angles to the polar axis). ⇒ BQ = CO Cos Lat. ⇒ arc AB = arc CD Cos Lat. ⇒ Distance AB = CD (difference in long) x Cos Lat. (since 1 nautical mile along the Equator equals 1 minute of arc). ⇒ Dlong = Ddist /Cos Lat. Note. Since the secant is the inverse of the cosine, the formula for Dlong can be simplified to: Dlong = Ddist x Sec Lat. Click here for a practice exercise on this topic. A thorough treatment of this topic can be found in the book Astro Navigation Demystified. This entry was posted in astro navigation, Astro Navigation Topics, celestial navigation, navigation and tagged astro navigation, celestial navigation, navigation. Bookmark the permalink.